ChatMessage is the basic message unit in RadChat. It contains information about the author and time of message. Depending on the specific information that a message stores, the available message types are listed below. By default, when you type in the text box and confirm the message, it is automatically added to RadChat. This behavior can be controlled by the AutoAddUserMessages property. 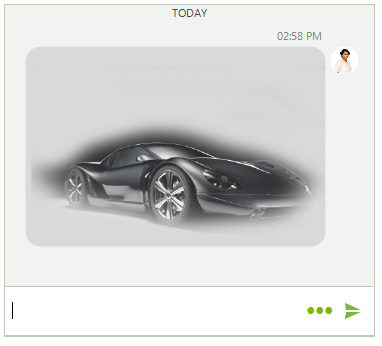 In addition, the SendMessage is fired each time a new message is about to be added to the chat UI. It is allowed to modify the message itself. Since R3 2018 it is exposed a UserData property in all message types. Thus, along with all other parameters when adding a message, you can pass some useful data that can store any information. 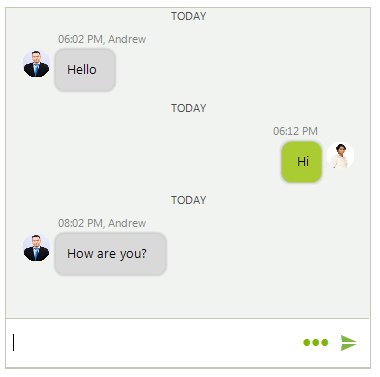 A ChatTimeSeparatorMessage visually separates the messages according to a certain period of time. The TimeSeparatorInterval property specifies this interval. 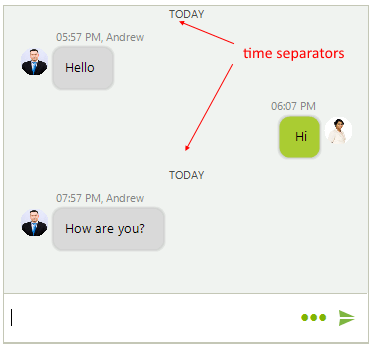 RadChat will automatically add the time separators when the interval between the messages exceeds the specified TimeSeparatorInterval. A ChatTextMessage represents a single text message by a certain author and sent at certain time. A ChatMediaMessage represents an image message by a certain author and sent at certain time. A ChatCardMessage stores a message that visualizes a card element, a descendant of BaseChatCardElement. In the Cards help article you can find additional information about the different card types and how to add card messages. A ChatCarouselMessage allows adding and visualizing multiple card elements. You can also add different actions to the cards. 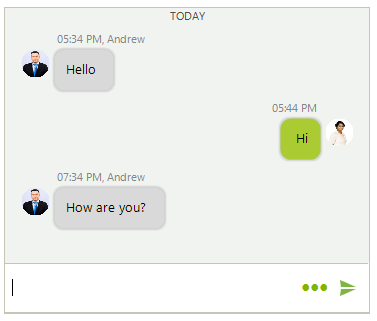 A ChatOverlayMessage represents a ChatMessage that displays an overlay element either as a popup, or over the messages container. It requires some action by the user, e.g. 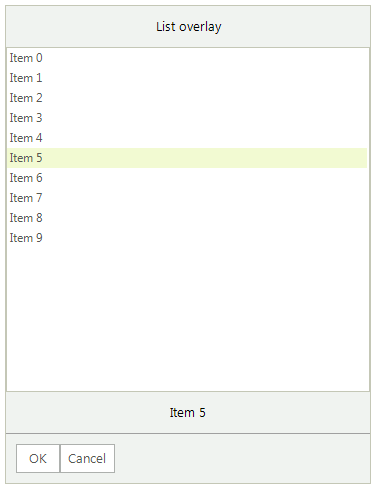 pick a date or select an item. Once the action is performed, a message is inserted in the chat view. The ChatOverlayMessage can host any BaseChatOverlay: ChatCalendarOverlay, ChatDateTimeOverlay, ChatListOverlay, ChatTimeOverlay. A ChatSuggestedActionsMessage represents a message offering a list of SuggestedActionDataItem to the user. Once an action is selected, the SuggestedActionClicked event is fired. Then, you can choose how to proceed further, e.g. adding a message with the user's choice.